I snapped this picture today as he was pulling fabric off of my shelves…right after he had shoved toys down all of our heat vents. At least he keeps himself busy while I’m feeding the baby right? Besides digging toys out of the heat vents I cut this stack of squares…hopefully it will manifest itself as a finished quilt + pattern someday soon (don’t bet it on it though). I have to admit that I’m TIRED…and keeping 3 kids fed, clothed, and happy takes 100% of my energy. At the same time having a new baby is also a good reminder of what’s important…so the rest of my house may be a disaster zone and we’ve had cold cereal for more than a few meals…but at least my kids are fed, clothed, and happy (and cute)! I say at least once every day (usually muttering to myself like a crazy lady, mind you!) "My house may be messy but my children are loved!" My three babies still keep me hopping (and the baby is approaching 1 year old!). Oh I love posts like this about real life things. 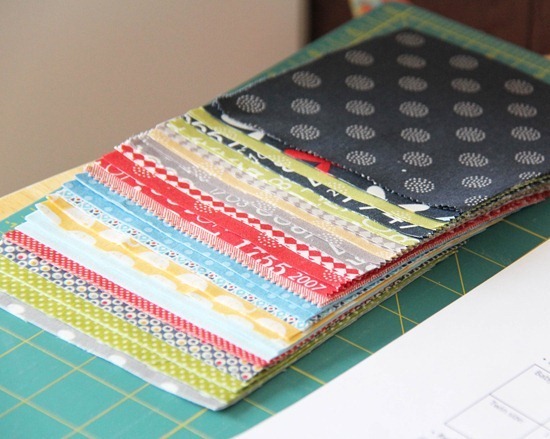 The fabric stack looks yummy too! And boy your kids are cute! My husband and I are thinking of having a 3rd soon and I love to hear how other people handle 3 or more kids and what works for them. Hugs and sleep to you! I always like to look at my two monkeys after they're asleep, it helps me put things in perspective when they're quiet and still! Beautiful pic of your beautiful babies! My mantra is something like: This isn't meant to be a museum – real people live here and occasionally it will look like it. I'd rather play with the kids and have things be un-tidy than have it perfect and have neurotic kids who freak about stepping on the vacuum lines in the carpet! Hang in there! I was in the same place last year, and there is definitely light at the end of the tunnel. Enjoy every moment, because it seems like each kid's first year goes by so stinkin' fast! btw, those are some precious moments you captured! Oh! This picture (both of them!) is priceless! 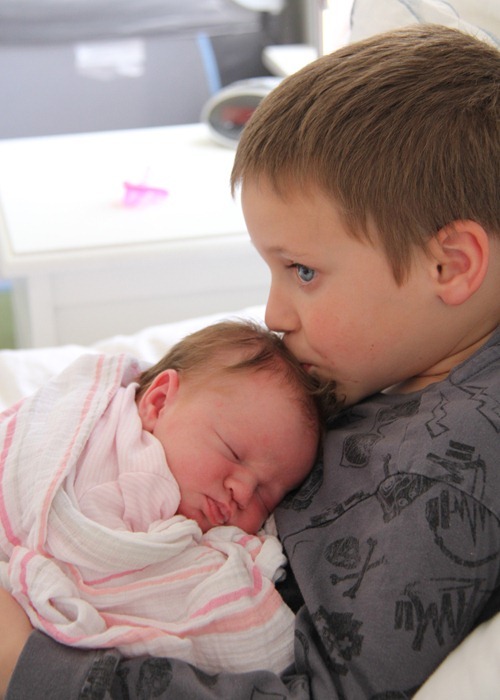 Love the big brother holding his baby sister – so sweet! 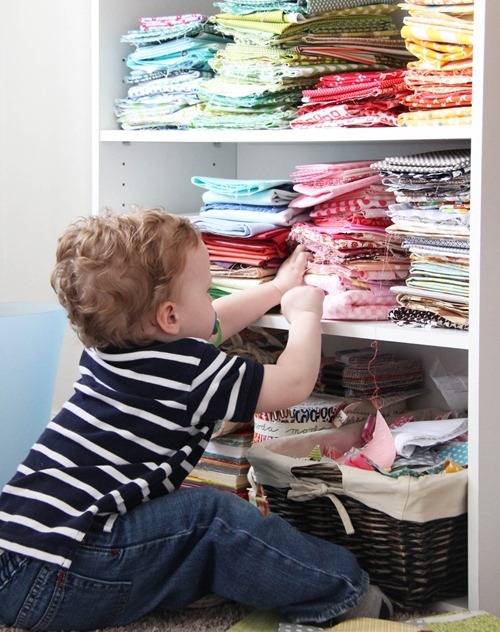 And the little guy checking out your stash – tooo cute! Hang in there mom! I remember those days – they are exhausting and they go wayyyyyy tooo fast! Enjoy! And hope you get some rest! It looks like you are doing a brilliant job of raising your children in a happy, caring and productive environment. Good for you! Having 3 under 3 myself, i am sooo there with you. My house is a mess, my yard is a mess, my car is a mess, my hair is a mess, what is makeup? I live in trackies and have even dared to venture out of the house in them these days. But i too have gorgeous boys that i would not swap for the world. If only i could get a whole night's sleep !! Hang in there Allison, you'll never regret having your priorities where they are right now!!! Love your blog and your children are adorable! Just remember when it is nap time, it is also nap time for mom too. SO you are energized and ready to tackle the world after wards. When the dishes get done, they get done. Who cares. Same with the laundry, as long as you have something to wear today. You will eventually find a rhythm and then it will be all ok again. Your blog shows your priorities are great and that your children are adorable. 30 years from now you will forget toys in vents, cold cereal and fabric on the floor, but the love will remain. This is such a sweet time in your kid's lives, and I am glad that you are doing your best to enjoy these days. It's worth it. I promise! Hang in there! Sending you energy. Enjoy your adorable kids. This too shall pass. :) By the time my fourth baby was 6 weeks old, I got shingles from all the stress. It gets better, I promise. Just enjoy those kids, and the rest will come. I feel your pain, we have four little ones and it's a miracle I get anything done! I posted this on my blog back when we had three and I had to share it. I think it will make you laugh and you'll appreciate the comic. Haha!! I could have written that first part myself! I remember when my 3 year old tweebs would reap havoc while I nursed their baby sister. Their favorite things to do was pour chocolate soy milk and hotwheels down the vents!! I finally started strapping them into their high chairs with snacks and a book while I nursed her. Hang in there momma. There will be plenty of time for sewing someday. Love those babies now, because they grow up so fast. And yes, they sure are cute. You are so right! You have beautiful children, you are home with, raising them, feeding, nuturing them, loving them! I'm amazed that you can blog about it! I remember raising mine (they are now adults, hard to believe but we all made it :D) and I didn't even blog about it) And that probably is a good thing. I love your blog, you are amazing! Thank you for sharing and keep up the amazing job! What a blessing our families are! That last picture is adorable. Love those little baby cheeks. I remember when my 3rd was a newborn (I'm about to have my 4th any day now, so I need to remind myself of these things, too), and the Health Nurse came for her one week check in visit. I told her, "My house is a mess, the floors are all sticky, and aside from supper – which has been brought by other people – we have been subsisting on peanut butter and jam sandwiches and cold cereal". And she said, "That's just the way it should be right now. Keep sitting and nursing and loving that baby. That's what's important." Why exactly are those shelves full of fabric sooo enticing? Mine are always knocked onto the floor, too, or else they are full of lego. And apparently the best substance for lego mini-figures to use to repel off of those fabric cliffs is the thread in my thread drawer . . . I feel you! My baby is almost 8 months old, and now I'm homeschooling the 8 and 5 year old, and I'm living between 2 houses in 2 states! I'm ready to tear my hair out. Good thing a little sewing therapy goes a long way. SUCH cute kids. I love it when you catch them loving their siblings. It makes your heart sing! I am amazed that you get any sewing done at all! I had my 4th a little over a year ago and have completed so little since them. Like you said the kids take ALL your energy! Glad to see you have your priorities straight. Like has been already said you won't ever regret it! Keep up the good work and hang in there! Yes, the house cleaning and quilting will be there tomorrow, but they grow so fast. Enjoy them while you have the opportunity! Sounds like you're the perfect Mom! Enjoy these little ones….they will grow faster than you'd ever imagine. The picture of your little boy holding the baby is priceless! Believe me…you are among friends who understand. Don't give up. There is a light at the end of that long, messy, sleepless tunnel. Oh bless your heart. It is the hardest job in the universe – but your children are beautiful, and a precious blessing. Best Mommy advice: Sleep, don't worry, it will all work out okay. I know EXACTLY how you feel right now. And when I do have the moments I'm so overwhelmed by all the to-dos that I freeze. Eu tenho saudade até dessa fase em que você está atravessando…Hááá. E que saudade. !É tudo tão tumultuado,tão cansativo,mas passa como um relâmpago.Hoje tenho um neto de 18meses,que fica assim mesmo nos meus tecidos.Casa sempre pode esperar,o importante são esses lindos que tem que ter carinho e atenção 24 horas.Você está fazendo um ótimo trabalho com eles,os rostinhos estão serenos.Parabéns e Deus te abençoe e a sua família.Beijos. Lovin' your blog. I have three kids 8,6,4.I have been there done that. Cherish the moments and don't sweat the little things. Even though they might bug you. They sure did me. But, sleep and cuddling is so much more fun :). That kissing picture is priceless… and so is a mother's job. I try to measure my accomplishments in hugs and cleanliness, and disregard the messes and clutter. The fact that you have a (great) blog you're keeping up on top of taking care of your kids and hobbies… you are the WOMAN! I hear you! I have three kids too, and they are a handful. Great kids, dont get me wrong. Adding the third child adds a whole new dimension to our world. And your kids are beautiful! Love the colors of that fabric. So one of the links at the bottom of this post was "kids for sale." I clicked on it and you were writing about the baby crying–who must now be the middle child, right? And again, "Good thing they're cute." I so agree! And they are absolutely adorable! Look at that sweet picture! Doesn't it help you get through the rough days? Having your third really throws you over the edge into CRAZY. But, as always, this too shall pass. Let go of those unimportant things and enjoy those little people. So sweet! I remember when my three boys were all little. I was tired ALL the time! Never felt rested! Does it help to know that some day you'll look back and smile at the memories? Hang in there! What a beautiful photograph of your son and daughter! Your kids are loved and it is more important than a clean home no ? I want to make quilt patterns and I was wondering if you knew of a "tutorial" on how to make it ? I have EQ7 so I guess it will help me but I have no clue on how to make this.. I don't know if you can help..
Oh my!! Those are the cutest pics ever! Take it all in, it will go by so fast! I have been watching my young grandchildren ages 3 & 7. At 63 I find it is hard work but I love it. The comments above say it very well. These years are priceless and they pass so quickly. Someone once told me that children will not remember the house clean but how much love. you can always clean house and cook, but a day spent like that, is missing something precious you can never get back. enjoy the babies while you can, they really do grow up, and out the door. faster than you can imagine. my oldest grandchild turned 13 and i still feel 21 in my brain. not so much the body tho. I have a smile that goes all the way through to my heart. Being on "the other side" with both my children in college- your post made me laugh! I loved reading the encouragement from the other young mothers and the grandmothers. I do give you all credit in how you have babies but are keeping the creative side in your life also. I loved what RaeLyn said about expectations. Enjoy the little moments in each day…laugh much! Mine are 9,8,5 yrs old…I promise they get easier and your energy will return! When your baby girl starts walking and your 2 hands are more free, (you still have to chase) but I felt it was much easier being outnumbered when I didn't have to carry a baby! Oh so cute!!! Rest and enjoy! Oh, one more thing… I just bought a layer cake of the same "Reunion" line from Moda. I don't know what I'll do with it, but it is so cute! My daughter is happy and busy too, may be just as well that I only have one. Your little guy in the stash is demonstrating a skill that's pretty neat for his age. He's learned that he can pull an item out of stack more easily if he uses his left hand to hold the stack in place above his right hand. That's a smart little guy! I'm impressed that you've gotten anything fabric-related done at all! It's been two weeks since my little one arrived, and the only thing I've done in my sewing room is make the bed for a guest. So, pat yourself on the back, realize that cereal is a balanced meal (as long as it's served with milk), and try to take a nap! As I bounce my 8 week old on my knee and stare at my stack of fabric waiting for me, I can completely relate! Hang in there! Hang in there! I hear you. And seriously, what is with those kids throwing stuff down the vents!? My son dropped a tennis ball one time and I could hear it rolling down throughout the house! Someday when my kids are a bit older, I'm going to get my vents cleaned out and I will probably find enough toys for a yard sale! I'm just nervous one of them will throw something dangerous, like a bottle of milk, down the vent and then the house will stink! Oh, as a mom whose kids are all over 20, I sure do miss the young years. I enjoy looking at their photos on the wall, though, and hope that someday they'll grant me some grandchildren. You mean that's not what the heat vents are there for?! How do you do it? I have an eleven month old and have a hard time keeping up with just him :) I love all the pretty fabric. I'm a new follower. I'd love for you to follow me back! Your kids are adorable! And that is the sweetest, most precious little baby girl. You're giving me baby fever! ack!